Just look at the great group effort to prune the 125 hybrid teas, floribundas, and climbers at the Monterey Bay Rose Society's display garden at the Santa Cruz County Fairgrounds outside of Watsonville on Sunday. The garden will be finished on Wednesday and ready for new top dressing. It's much easier to add soil amendments and mulch once the bushes have been reduced in size. My home garden is about half done and I hope to return to it later today. 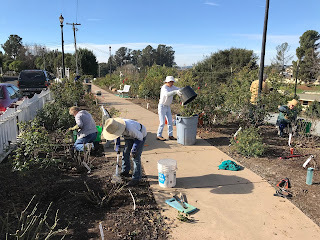 But during the pruning, I was reminded again of the importance of opening up the center of bush, getting rid of all canes which cross over the center, and pruning to a healthy outside bud eye. During my last time pruning, I found the following cane and thought you'd benefit from some advice. Occasionally you will find a damaged cane on one of your bushes which somehow got scaped during the summer. 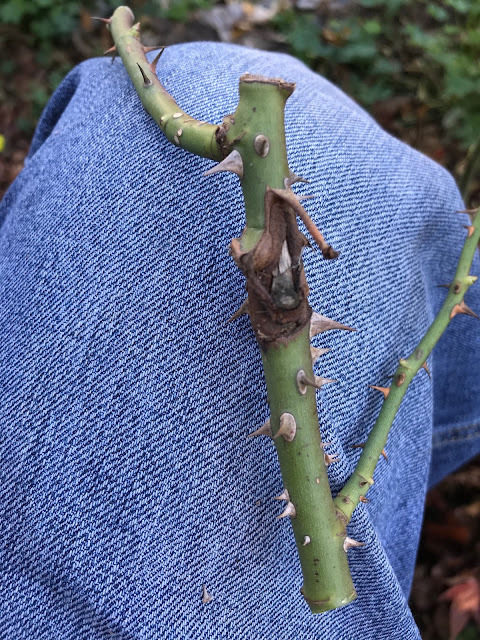 It's best to prune off any canes that have been injured like this as they are only supplying the upper part of the cane with half the nutrition needed. As the growth below the damaged area was spindly, I cut even further down the cane as the photo indicates.